The pro-statism crowd routinely argues that we need more government. Every so often, though, one of them inadvertently stumbles on the truth. But they then refuse to draw the logical conclusion. For instance. One of President Obama’s health appointees noted that quality increases and prices fall when markets are allowed to operate – yet he concluded that we should further restrict market forces in health care. The IRS Commission admitted the tax code is a complicated mess and that he pays someone else to compile his tax return – yet he dodged a question about whether Congress should fix the mess with something like a flat tax. A New York Times reporter produced a chart showing that the only successful budget deal in recent decades was the one in 1997 that included tax cuts – yet he then complained that we can’t deal with red ink because Republicans won’t agree to a tax increase. We now have another example to add to the list. Thomas Friedman is a columnist for the New York Times, where he specialize in ponderous columns that reflect the views of the left-wing establishment. Today, he has a column complaining about gridlock in America. Here are some key excerpts. Does America need an Arab Spring? …has American gone from a democracy to a “vetocracy” — from a system designed to prevent anyone in government from amassing too much power to a system in which no one can aggregate enough power to make any important decisions at all? …A system with as many checks and balances built into it as ours assumes — indeed requires — a certain minimum level of cooperation on major issues between the two parties, despite ideological differences. Unfortunately…several factors are combining to paralyze our whole system. This is remarkable, in part because he is stunningly wrong. The political class in Washington manages to spend about $4 trillion per year and churn out tens of thousands of pages of new regulation annually. The politicians also manage to enact dozens of new laws every year, almost all of which expand the size and scope of the federal government. If that’s gridlock caused by “vetocracy,” then I shudder to think what activist government looks like. But the part that really shocked me was that Friedman basically acknowledged that the problem is big government. …the huge expansion of the federal government, and the increasing importance of money in politics, have hugely expanded the number of special-interest lobbies and their ability to influence and clog decision-making. This is a facepalm moment. Friedman begins his column by complaining that our system is sclerotic and that this makes it hard for politicians to enact more laws, yet he then admits that our system is sclerotic because government is too big already. And it goes without saying (but I’ll say it anyway) that Friedman wants to make government even bigger – which is why he’s complaining about gridlock in the first place! By the way, I can’t resist correcting some of Friedman’s sloppy analysis in the final excerpt above. He complains about role of money and special interests in politics, but he fails to connect the dots. If he did, he would understand that political money and interest groups are inevitable consequences of a bloated public sector. As I explain in this video, big government facilitates and encourages corruption. To put it in colloquial terms, if you create a big pile of garbage in your living room, don’t be surprised when you get infested by rats and roaches. Earlier this year, I wrote about how the person Obama put in charge of Medicare made some very interesting observations about prices, competition, and markets, but then drew exactly the wrong conclusion about what was needed to solve the third-party payer problem in health care. We now have another example of someone producing very good information and then failing to learn the obvious lesson. 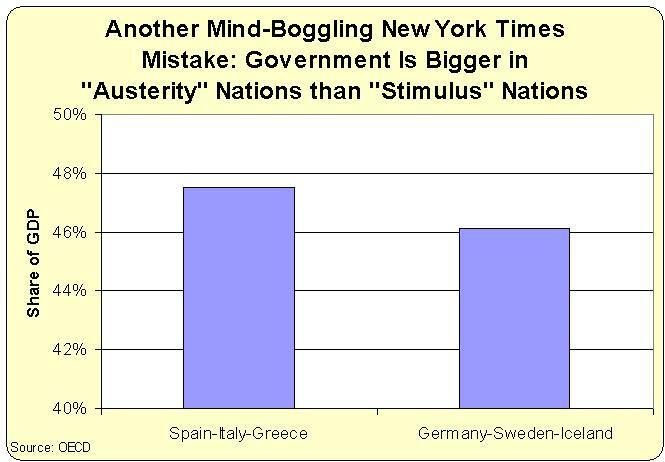 Catherine Rampell of the New York Times wrote about how politicians used to be much more willing to increases taxes. She obviously wants readers to conclude that bad, mean, wicked Republicans are being too dogmatic because they won’t agree to big tax hikes. 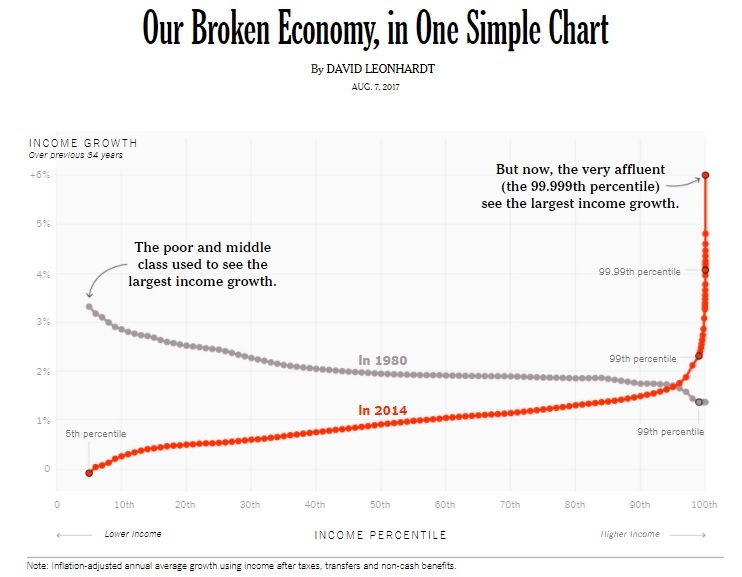 But the chart she prepared tells a completely different story. The only budget agreement that actually produced a balanced budget was the 1997 deal, and that deal contained tax cuts rather than tax increases! But don’t believe me. Look at her chart. I suppose I also should say that her chart is misleading because it accepts the dishonest Washington definition that a “spending cut” occurs any time politicians increase spending by less than previously planned. 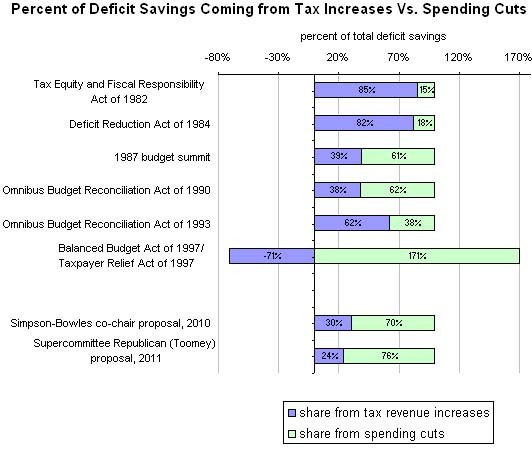 And even if one uses that dishonest definition, the make-believe spending cuts usually evaporate very rapidly. The tax increases, unfortunately, are far more durable. And the net result is higher spending and oftentimes more red ink. 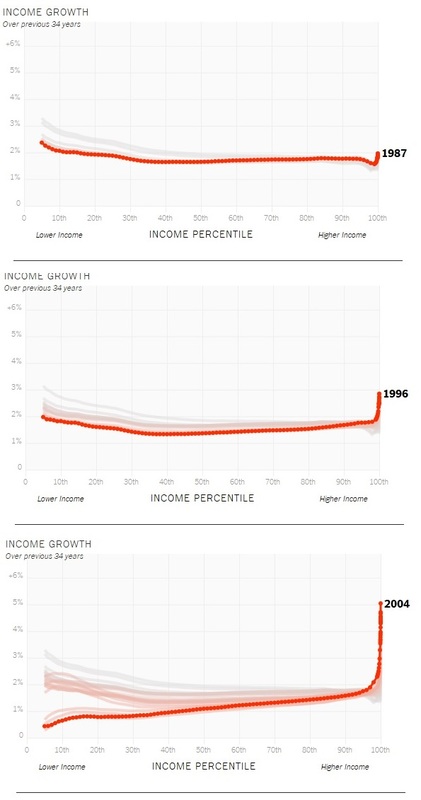 But even with those two big methodological shortcomings, her chart is a strong argument that tax increases don’t work. Two final points. First, anybody who thinks the 1993 tax hike was successful should read this post and you’ll see that the Clinton White House admitted it was a failure in early 1995. Second, it wasn’t really the 1997 budget deal that produced the budget surplus. The deficit disappeared because we had a period, beginning a couple of years earlier, during which politicians followed Mitchell’s Golden Rule and restrained government spending so that it grew slower than the private economy. The 1997 agreement played a role, but it’s quite likely that red ink would have disappeared anyhow. Last but not least, the reason we’re in a fiscal ditch today is mostly because Bush abandoned good fiscal policy and let the burden of government spending climb much faster than the productive sector of the economy. I haven’t said much about the 2012 election, largely because this blog tries to avoid politics and instead focuses on how public policy can promote or (all too often) restrict liberty. But every so often, I feel compelled to pontificate – usually because someone is saying or doing something foolish. This is why I want to talk about Jon Huntsman’s tax reform plan. But in this case, my ire isn’t directed at the candidate, who actually deserves credit for proposing a very good plan. Instead, I want to expose some very shoddy – or very biased – coverage by the New York Times. Here’s how the reporter, Ashley Parker, began her report on Huntsman’s proposal. Jon M. Huntsman Jr. again showed himself on Wednesday to be an ideological outlier in the Republican presidential field, calling for the tax code to be stripped of all loopholes and deductions. Congressional Republicans have resisted closing loopholes in recent budget talks, portraying such moves as tax increases. Huntsman may very well be an outlier is certain ways, but Parker’s portrayal of his tax plan – and how it meshes with the views of other GOPers – is simply false. The general Republican position, as well as the position of Americans for Tax Reform, is that it is perfectly acceptable and indeed desirable to get rid of tax preferences and distortions. But they should be eliminated as part of a shift to lower tax rates, not as part of some scam to give politicians more tax revenue. Well, take a wild guess what Jon Huntsman wants to do with the revenue from “closing loopholes.” Assuming your IQ is above room temperature, you probably have figured out that the former Utah governor wants to use every penny of the additional tax revenue to finance lower tax rates. And you’d be correct. Nowhere in Mr. Parker’s story, however, is there any acknowledgement of that important fact. Why not? To be honest, I have no idea. It could be bias. It could be incompetence. It could be that she had a preconceived narrative that Huntsman is a maverick and therefore she wanted to portray his plan as somehow contrary to GOP policy. But all that matters is she blew the story. Within two sentences, she completely mischaracterized Huntsman’s proposal and created a false impression that he was doing something that put him to the left of the Republican mainstream, when he actually has a tax plan that is much farther to the right than anything Perry or Romney have proposed.